I still have fond memories of staying on the farm with my Aunt Lula and Uncle Homer. Lu was my maternal grandmother’s sister, and she did not have any children of her own. She loved kids though, and was always happy to have us visit (at least I’m pretty sure she was). I’ll always remember her homemade donuts and how she laughed when I didn’t know that potatoes grew in the ground (hey, I was a city girl). Here she is with her first husband, who passed away before I was born. Don’t they look happy? I love this photo. In honor of Lu, I named my manikin after her. Meet Lula. I cobbled her together on a whim. It started with an old yellow Styrofoam manikin that a co-worker salvaged from a torn down mall. She was rather hideous, but I could see her potential. When I came across a small table with a fabulous base at a garage sale, I knew the base would be perfect for my manikin. Once again, I called upon my favorite handy man Ken, and asked him to come up with a way to attach the Styrofoam torso to the table base. Like magic, he made it so. I then painted her with black chalkboard paint. 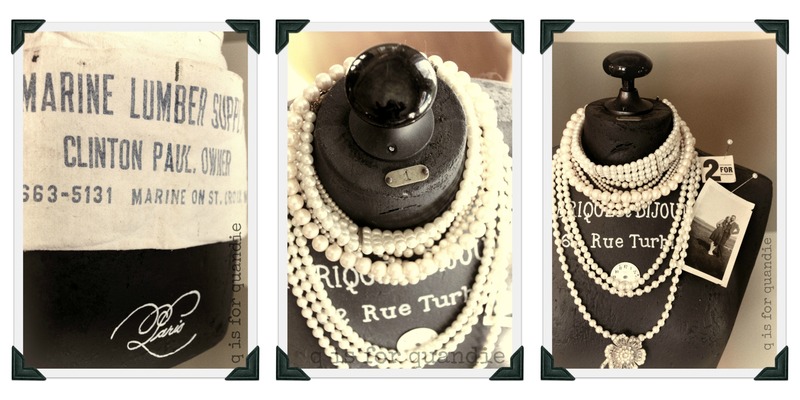 I topped her off with an old black porcelain door knob, and metal no. 1 tag. The writing was added using a chalkboard pen. 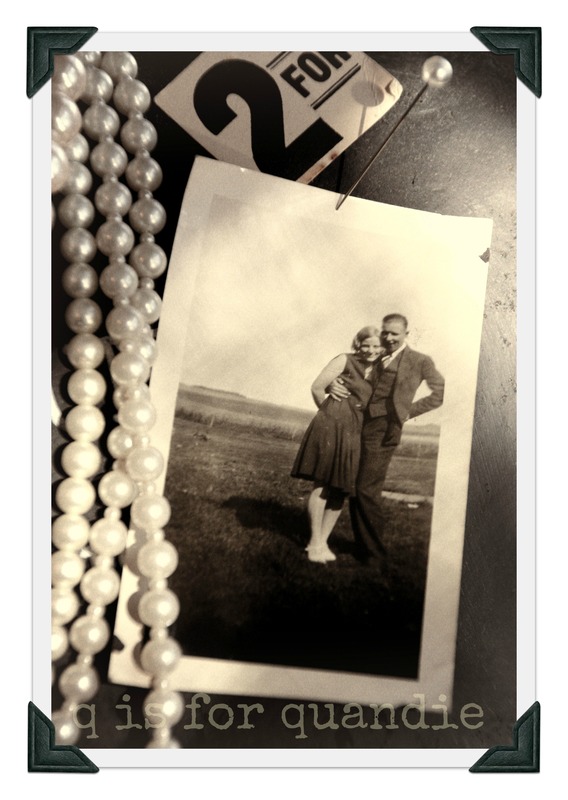 She’s wearing numerous strands of pearls, as well as an apron from my husband’s grandfather’s lumber supply store. Your manikin is really good. May I share it on my antique shop Facebook page? Lots of people would like a manikin and the antique ones are very expensive. I recently started a blog and I just changed my theme to Forever because I admired the way your blog looks. You are very talented. Thanks so much for your kind comments Ginene! Love it and Aunt Lu would be proud! Pingback: the rejects. 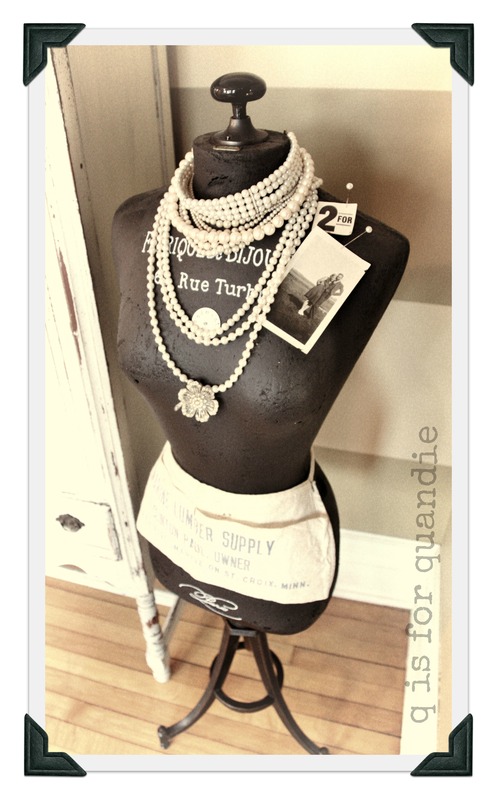 | q is for quandie.